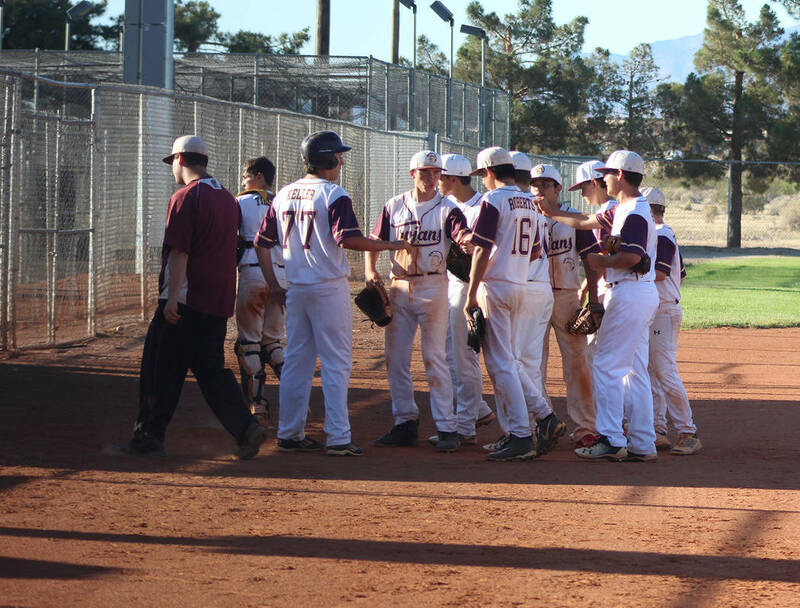 The Summerlin Panthers Green under-14 team in Southern Nevada Connie Mack Baseball was on a roll. It wasn’t just that they were 12-0 going into Saturday night’s doubleheader at Ian Deutch Park. It was how they did it. Tom Rysinski/Pahrump Valley Times Pahrump Trojans Gold players congratulate Roman Roberts on another scoreless inning during the Trojans' 7-1 victory over the Summerlin Panthers Green in a Connie Mack 14U National baseball game Saturday night at Ian Deutch Memorial Park. Tom Rysinski/Pahrump Valley Times Roman Roberts delivers during the Pahrump Trojans Gold's 7-1 victory in the first game of a Connie Mack 14U National doubleheader Saturday night at Ian Deutch Memorial Park. 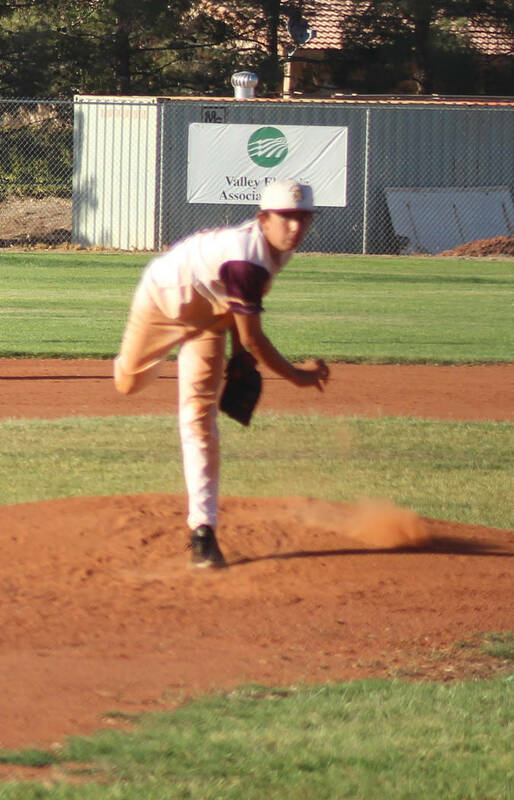 Tom Rysinski/Pahrump Valley Times The Pahrump Trojans Gold Connie Mack 14U baseball team defeated previously unbeaten Summerlin Panthers Green 7-1 on Saturday night at Ian Deutch Memorial Park, the Trojans' ninth consecutive win. What gave was the visitors’ winning streak. Roman Roberts overcame a shaky first inning to come within an out of a complete game, Sterling Oshiro drove in one run and scored two, and Jalen Denton belted a home run to help the Trojans record a 7-1 victory in the evening’s first game. The Panthers rebounded in the nightcap, taking an early lead and holding off the Trojans for an 8-6 win. “We played a pretty good team tonight,” Middleton said. “They were undefeated coming in here, so to come out and beat them 7-1 in the fashion that we did was impressive. The split left the Trojans Gold at 10-4-2, trailing only the Panthers’ 13-1 record in the National Division. A two-out, three-run second inning provided all of the runs Roberts would need. Oshiro got things started by sending a ground ball deep in the hole at short and reaching first safely when a low throw could not be handled. One out later, Roberts was hit by a pitch and Zack Cuellar walked to load the bases. Coby Tillery walked in a run, Ryan Braithwaite singled in a run, and Jay Amaya walked in another run to cap the inning and give Pahrump a 3-1 lead. The patient Trojans took advantage of eight walks, two of which came around to score and two of which forced in runs. An inning later, Jake Riding singled, took second on a wild pitch, moved to third on a passed ball and scored on a single by Oshiro. The lead increased to 6-1 in the fifth when Oshiro doubled and a wild pitch mixed in with walks to Louis Sposato, Cuellar and Tillery plated two more. Denton then capped the scoring with a booming shot to left-center field, beating the relay throw for an inside-the-park home run. Middleton has been impressed by what he has seen from Denton, who got some playing time as a freshman with the Pahrump Valley High School varsity. Meanwhile, Roberts was cruising along. After getting out of a jam in the first, allowing one run to score, he clamped down on the Panthers, allowing only one more hit and pitching into the seventh. Most games have been quality efforts for the Trojans since a weak start, when they opened 1-3-2, including a tie and a loss to SLAM Academy, the team just a half-game behind them in the standings. “We knew we were better than how we were playing,” said Middleton, a 2014 Pahrump Valley High School graduate. “We’d have one rough inning and couldn’t get over the hump, then one game it all clicked. Since then, we won eight straight coming into tonight. Without teams at the 16U or 18U levels, Pahrump entered two teams in 14U with specific goals in mind. The Trojans Maroon team sits in last place in the American Division at 1-13-1. “We wanted to make sure we had one playoff team,” Middleton said. “I wanted to make sure we had postseason baseball, especially after the rough summer my 14U team had last year. We couldn’t get a 16 or 18U team, so we went with two 14U teams, one good team and one that is more of a developmental team. 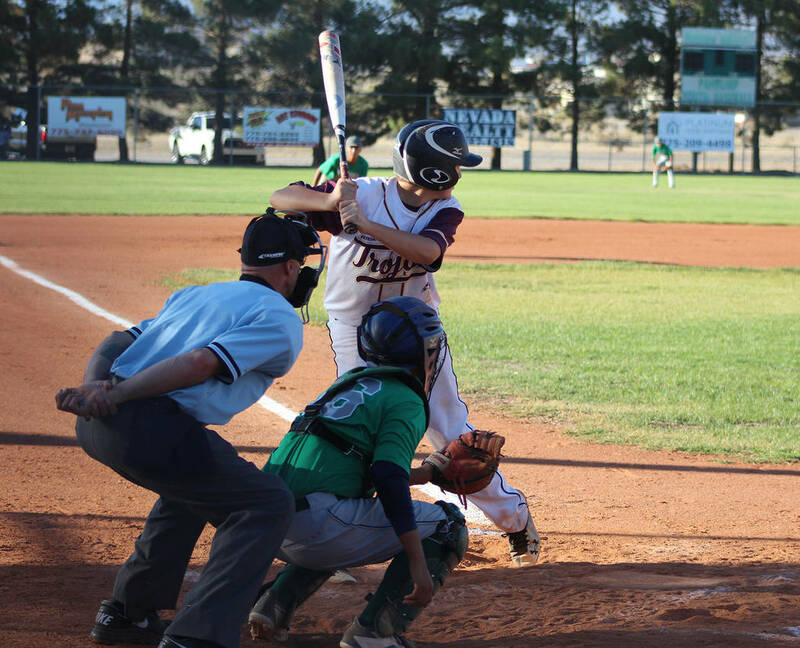 The two Pahrump teams have a game remaining against each other, and Trojans Gold closes the regular season with a doubleheader against the Las Vegas Chargers at 5:30 p.m. Saturday at Ian Deutch Park. A game against Desert Pines’ 16U team will be played before the playoffs, which will begin July 17.